Here’s an easy organic spray “recipe” to prevent black spot, powdery mildew, and other fungal diseases in your garden. Unlike some home remedy recipes, this one actually has university research behind it to demonstrate that it works. I feel it’s not as effective as commercial chemical fungicides, but it definitely reduces fungal diseases. 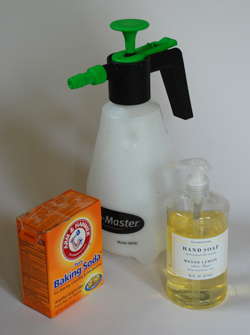 Mix together 2 tablespoons baking soda, 1 tablespoon liquid soap, and 2 quarts water. Use a large spray bottle if you have just a few plants; invest in a small landscape sprayer if you have dozens of plants to do. Repeat the spray at least three times, about 10 days apart. This should be accomplished before daytime highs regularly hit 80 degrees.